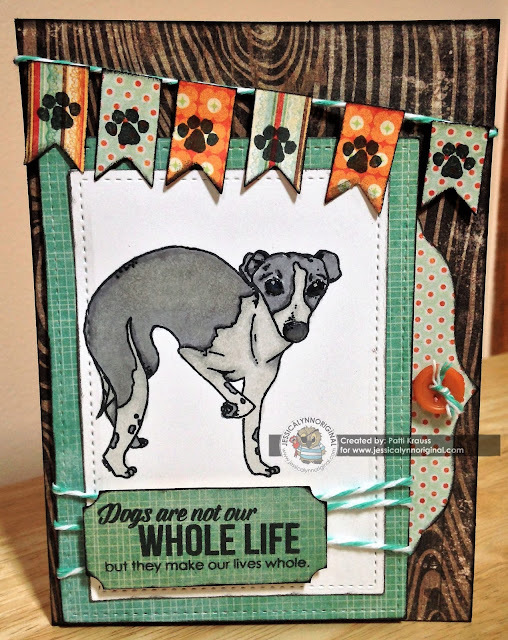 Hi Friends: Today I'm sharing another card using the new Italian Greyhound stamp set from JessicaLynnOriginal stamps. This stamp set is being released on May 6th, and if you go to the official JessicaLynnOriginal blog and leave a comment on the Greyhound post that day, you'll be entered for a chance to win a $15 gift certificate in Jessica's store. You can see other examples using this stamp set and other sets up on Jessica's Facebook page - why don't you stop over and share something you've made with her stamps? Thanks for stopping by today! I hope you have a creative day and take time to do what makes you happy! Stamp image onto smooth white cardstock with black ink and color with Spectrum Noir markers, then add Glossy Accents to nose and eyes. Once dry, cut image with stitched rectangle die and ink edges. Cut the next larger size label from the MME paper pad, ink edges, and layer under the focal image. Using coordinating papers, cut panel to fit A2 card base and cut a label edge using the Labels framelit. Stamp sentiment onto the same patterned paper used for the image frame panel with black ink, then cut with labels (ticket) punch. Stamp diamond label stamp onto pink shimmer paper with Versamark ink, heat emboss with clear gloss embossing powder, then cut with Fancy 4 Labels die. Layer sentiment oval onto diamond label and attach as shown. Add image with foam squares and finish with a strip of gems along the silver strip. Add baker's twine to the bottom of the focal panel, then use foam squares to add the sentiment label. Wrap a strand of baker's twine around the top of the background panel and it to the card base. Use foam squares to add the focal panel, then add the label edge to the right side and enhance with button threaded with the baker's twine. Use the Banners die to cut 6 banners from coordinating papers, stamp with the paw print, then use foam squares to add them to the banner twine at the top. Labels: Cards, Clear Stamps, dies, JessicaLynnOriginal, Rubber Stamps, Sizzix, Spectrum Noir markers, Stampin' Up!